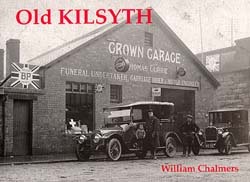 A famous town band (one of several brass bands in the town), Murdoch's Coffin Factory (which also made brass fittings for the Queen Mary), the Stirlingshire Territorials, 7th Argyll and Sutherland Highlanders, Haggerty Bros. with their ‘Flying Flea’ and the house where Lord Kilsyth sheltered from Cromwell's armies combine to create a fascinating potted photographic history of this ancient township. Coalmining of course is also featured with pictures of several of the pits in the area and the iconic rows of miners' houses. Auchinstarry Quarry also provides portraits of skilled quarrymen at work and posing for the photographer! The story is completed by images of the town celebrating May Day in 1950, the coronation of King George and of course the achievements of several of the local football teams.